We currently offer 30 years of unpaid bills and ten years of paid bill history online. This website provides a search bar at the top of the page to make it easy to access your property tax information and bills from one location. If you have your bill, the easiest way to search is by Parcel Number for secured bills and Property Number for unsecured bills. The search bar contains a drop-down search menu and a text box next to the search menu. Hover the cursor over the property search box (Search By?) and click to select a search type from the drop-down list. Enter your search criteria into search text box located next to the search menu and then click the "Enter" key. When you perform a search, the website returns a single property record and all the bills associated with that property. There is one row for each bill listed in order of bill date. Each bill row contains a first and second installment column. You can determine this by looking at the top right hand corner of your bill. The label will state "Secured" or "Unsecured". Select the appropriate property type from the Search Menu. Once you have identified your property type, select one search type from those listed in the drop-down menu. See the table below for additional information on each search type. Click on one of the Search Type links below to see additional information for particular search types or continue with the example. Below is a comparison of information provided, depending on the Search Type selected. In order to facilitate searches, we have introduced a feature called auto-complete which is available for all search types. This feature automatically returns a list of results when entering at least three characters into our search criteria box. 1. The Parcel Number is located on the top left hand corner of your bill. Enter the first eight digits of your parcel number. 2. Once you have identified your parcel number, select "Secured Parcel Number" from the Search Menu. 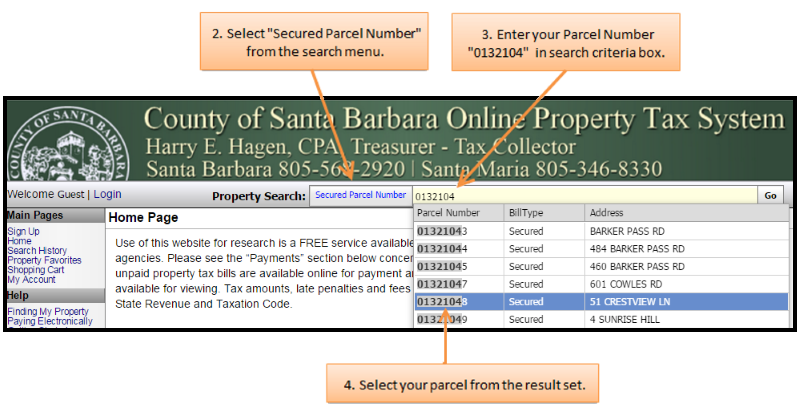 Enter a parcel number in the search criteria box. As you enter the first three characters of the parcel number, the system will return a list of secured parcel numbers that match your criteria. Enter all eight digits or select one of the records in the list or keep adding additional characters until there is one parcel in the list. The auto-complete list contains multiple columns to assist you in selecting the appropriate property. In the example below, the user the first seven digits of the parcel number and then selected the parcel number from the list by verifying the property address. 1. The Parcel Number is located on the top left hand corner of your bill. Enter the first eight digits to locate your property. 2. Once you have identified your parcel number on your bill, select "Secured Parcel Number" from the Search Menu. Enter a parcel number in the search criteria box. The auto-complete feature is enabled for this type of search type. As you enter the first three characters of the parcel number, the system will return a list of secured parcel numbers that match your criteria. Enter all eight digits or select one of the records in the list or keep adding additional characters until there is one parcel in the list. The auto-complete list contains multiple columns to assist you in selecting the appropriate property. In the example below, the user only entered the first seven digits of the parcel number and then selected the parcel number from the list by verifying the property address. Parcel Address Search: The address search feature is based on the Assessor's situs address exactly as it appears on your bill. You may use this search even if you don't have your bill, but you do know the Parcel's Address. 1. 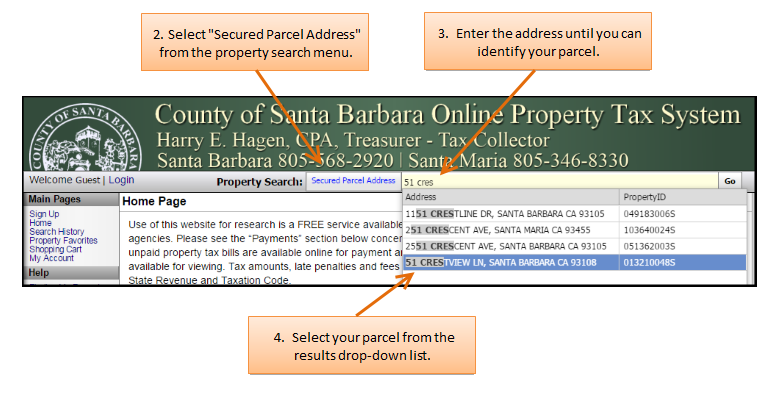 The Secured Parcel Address location is located on the top left corner of your bill and is directly under the parcel number. 2. You can search for any alphanumeric string within the address using the auto-complete function. For example, if you know the house number is 51, enter "51" into the search criteria or you know the street name is Crestview, enter "Crestview" into the search criteria. In the example below, the taxpayer entered "51 cres" and was able to select the remaining address from the auto-complete results. The system returns up to 15 records that match your criteria. In order to view additional records, scroll down the auto-complete result list to obtain the next 15 records. 1. 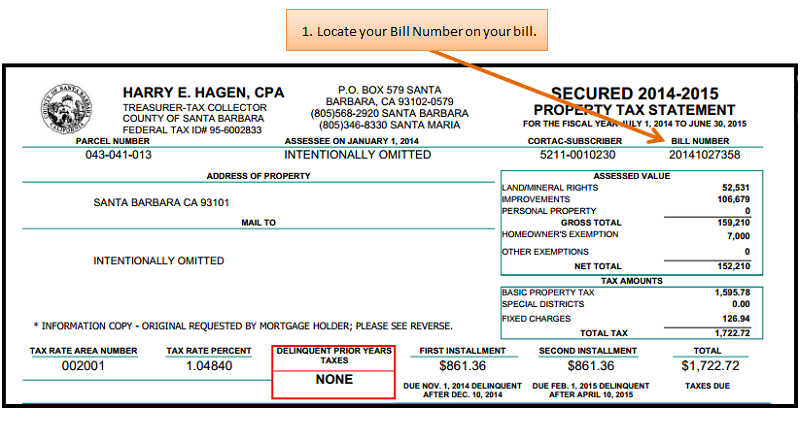 Locate your Bill Number on your bill. 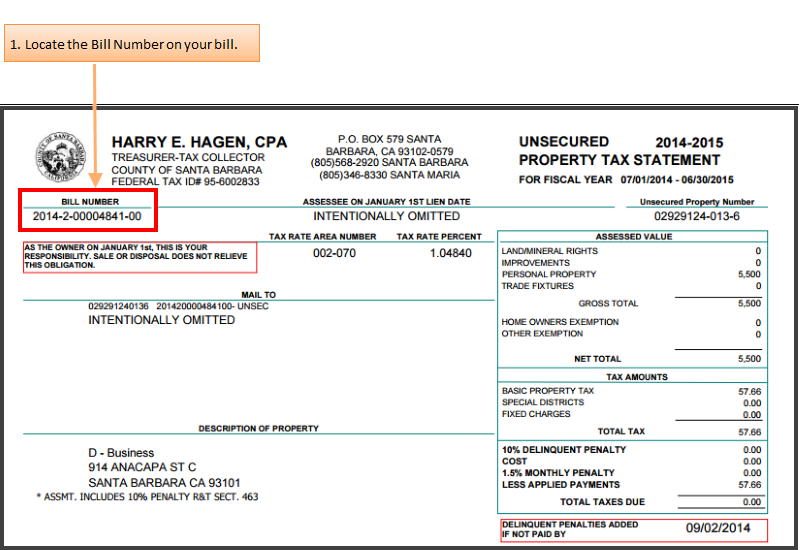 The Bill Number for Secured Property is located near the top right corner of the bill. 2. Select 'Secured Bill Number' from the Property Search drop down menu and enter the Bill Number. 1. 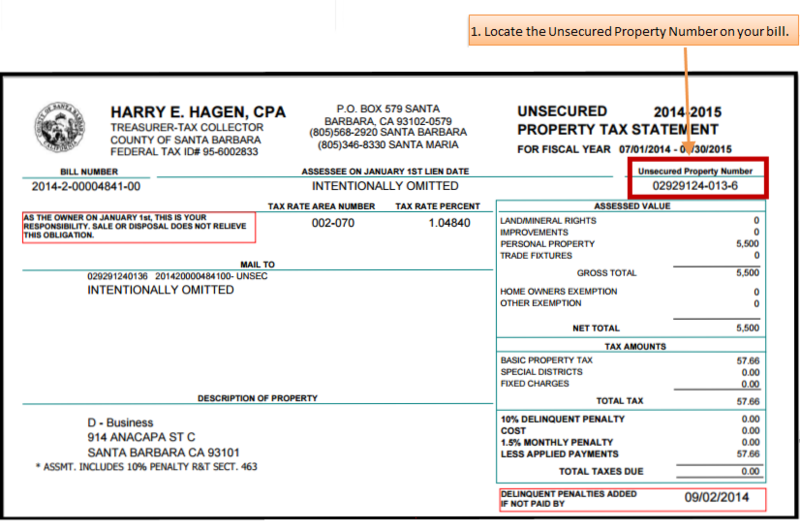 The unsecured property number is located on the upper-right side of the bill. Please ignore all dashes and spaces when entering a property number into the search criteria box. In the example below, the unsecured property (parcel) number is "029291240136". 2. Once you have identified your property number on your bill, select "Unsecured Property Number" from the Search Menu. 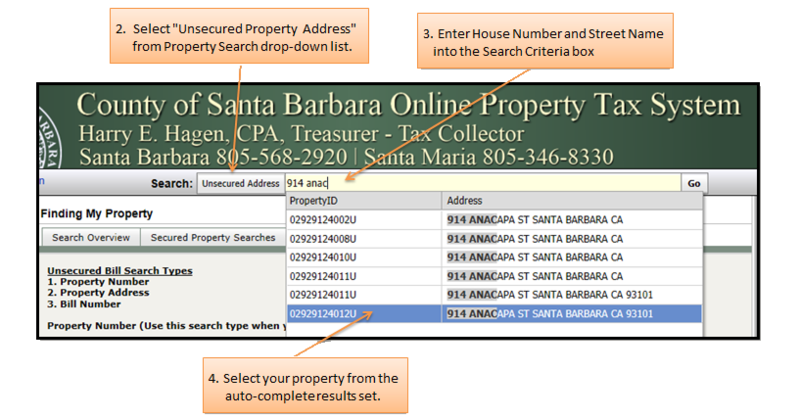 Enter your complete or partial property number in the search criteria box. As you enter more than the minimum of three characters, the system will narrow the list of unsecured property numbers presented. Select one of the records in the list when the list is manageable. The auto-complete list contains multiple columns to assist you in selecting the appropriate property. Property Address: You may search by property address on your bill or if you know the property's address. 1. 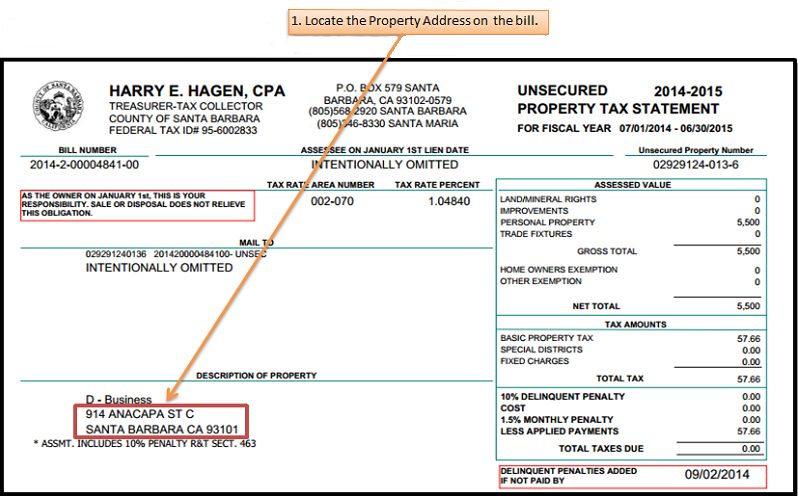 The address is located under Description of Property on your bill. You can search for any alphanumeric string within the address with the auto-complete functionality. A good rule is to start with the house number and street name only. 2. Select "Unsecured Property Address" from Search Type drop down. Enter the house number and street name into the search criteria box. Finally, select your property from the auto-complete search result set. 1. The unsecured property bill number is located on the upper left of the bill. In the example below, the bill number is "201420000484100". Please ignore all dashes and spaces when entering the bill number. Enter your complete or partial bill number in the search criteria box. As you enter more than the minimum of three characters, the system will narrow the list of bill numbers presented. Select one of the records in the list when the list is manageable.